Our cooperation starts from visit and analysis of possible options of your place by specialists. We are working out technical task according to your wishes and taking into account nature of the soil, presence and the level of groundwater, microclimate of the site, insolation, visual communications. Last stage includes the check of utilities on the site (water, gas, electricity and sewerage). Important point to discuss is the nature of accommodation (number of family members, average duration of residence, daily activity, presence of pets), development projects (house, garage, parking lot, bath, guest house, pool etc. ), elements of garden and of course your preferences (patio, arbor, pergola, pond, creek,rest area etc.) In case of need we discuss relief (geoplastic), supporting walls and small architectural forms. Plants specialists take into account all your preferences concerning trees, bushes and perennials as well as any of your stylistic suggestions (Spanish, English, French, Japanese, Italian, American etc. types of gardens). As to flowerbeds we need to know about your preferred colors and presence of thematic gardens (garden of irises and peonies, rosary, yard). To finalize the last project stage we discuss all engineering activities as to light, drainage and watering. Than our Company performs some different conceptual sketches of your area with explanations. This is the most responsible stage of the project since depending on it you would be able to imagine your site in future. Based on this data we work out conception of landscaping design and drawings (general plan, layout drawings, map of garden with plants, drawings of decorative paving, structure of walkways, constructive design of supporting walls, ladders, vertical planning (geoplastic). Mapping must be done with the scale 1:100 or 1:200 to develop drawings. On your wish we are able to create detailed plan of lower-gardens, rockeries, mixborders. Our Company also provides sketches of small architectural forms and wooden compositions. 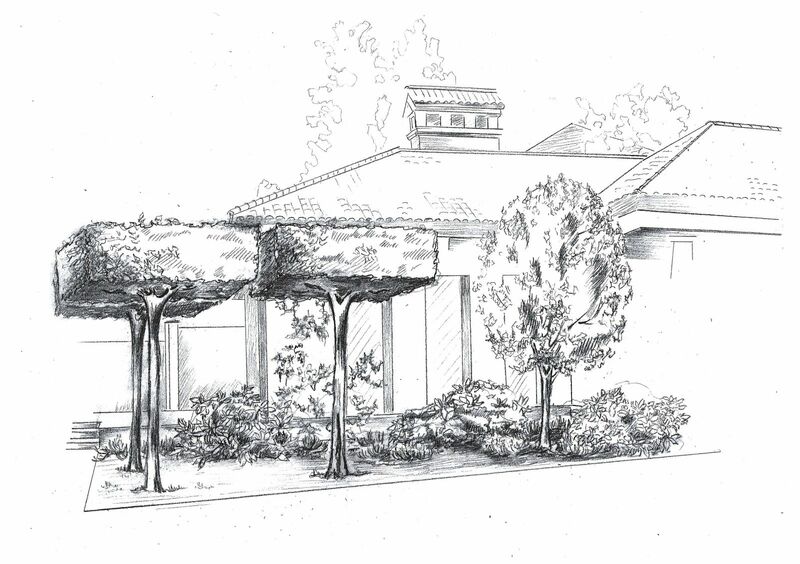 Detailed sketch of decorative elements, paving, lining etc. could be done on request.